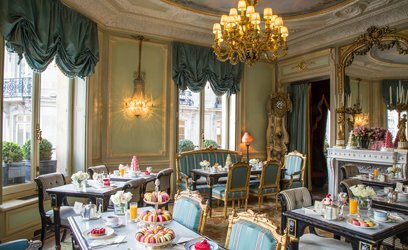 Ladurée welcomes you into a warm and tasteful setting, whose elegance will lend itself perfectly to your needs. 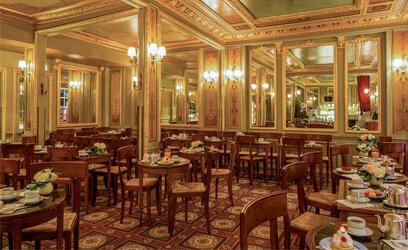 Our tearooms can be found on the Champs-Élysées, Rue Royale, Boulevard Haussmann, and Rue Bonaparte, and can all be used for private or corporate events. Our aim is to help you make your event perfect - something your guests will never forget. Why not treat yourself to a delicious breakfast, lunch, afternoon tea, cocktail, or dinner, by booking a table at one of our restaurants on The Fork? You can also reserve one of our rooms for a truly memorable private event. 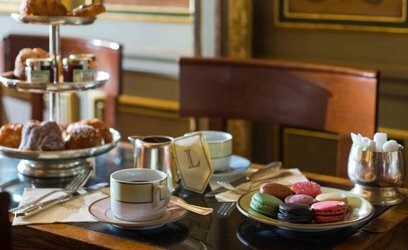 Mixing French gourmet cooking with patisserie classics and seasonal treats, Ladurée's many menus offer essential, delicious treats that are the perfect fit for its restaurants and tearooms. We offer a selection of breakfasts, lunches, dinners, and cocktails, as well as our famous desserts and sweet treats. * Our rates are susceptible to change throughout the course of the year, and will be confirmed when your order is placed.